Work begins soon on Seacourt P&R extension, which we opposed fiercely. Click table and images to enlarge. Weekends are quieter in the park and rides than are weekdays. Nevertheless we collected today’s data. Some was not available, as shown. So we visited Redbridge and Seacourt at peak times and there were plenty of empty spaces as the photos show. a Habitat of Principal Importance. It’s important habitat for many species including several badger setts. But, before the matter has even been before a Planning Committee for a decision, the City Council has cleared the area over the last week or so. The pictures tell the story. What a sad disgrace. It’s easy to get lost in the long and complicated arguments over flooding and planning objections. There is no need to increase capacity at Seacourt P&R. 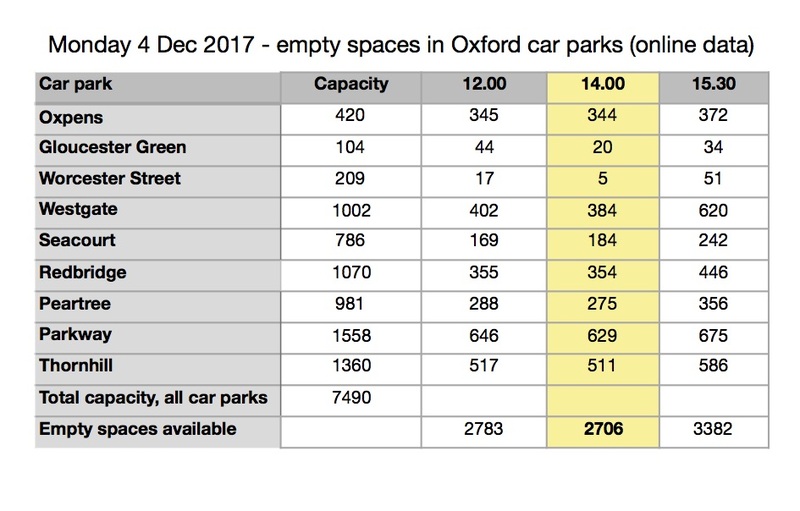 Oxford has more than enough parking, including enough park and ride. This is despite the opening of the new Westgate shopping area. If the parking isn’t needed then why does the Council want to spend over £4 million of your, public, money on it? Never mind that it will sit largely unused, and be subject to flooding, and expensive pumping out, maintenance and repair. No, we don’t understand it either. We looked at online data two days ago, Monday 4 December, 3 weeks before Christmas. At the busiest time, 2pm, there were over 2,700 empty spaces, many in park and rides. Seacourt and nearby Redbridge had 538 empty spaces between them. 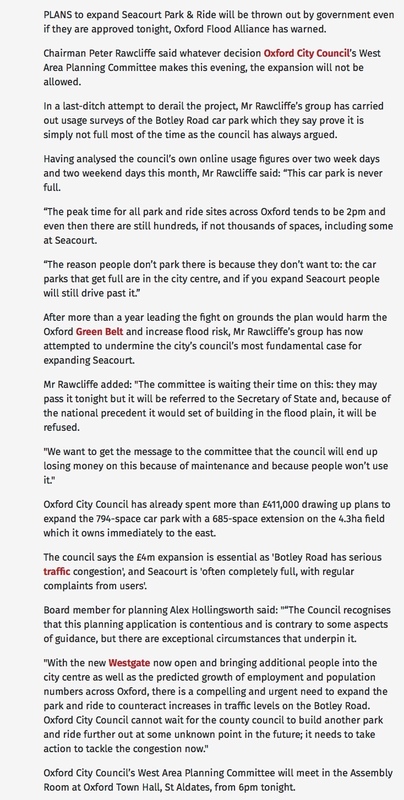 We are very strongly opposed to the proposed extension by Oxford City Council of Seacourt Park and Ride on the Botley Road, which has been mentioned here before. If you want to see our latest objections go to http://public.oxford.gov.uk/online-applications/applicationDetails.do?activeTab=summary&keyVal=OFE2FHMFIAV00 where you can see not only ours but the serious objections from others too. If that doesn’t take you there direct go via https://www.oxford.gov.uk/info/20066/planning_applications click ‘View and comment on planning applications’, twice, and then search for Seacourt or 16/02745/CT3. We wrote to you earlier with regard to the validity of the so called ‘sequential test’ carried out for the Seacourt P&R extension. In addition to our previous argument about the existence of an option of negotiating with the landlord to erect decking on the current site, we have further grounds for objection to the ‘sequential test’. The City Council Executive Board papers for 15 December 2016 include proposals for removing 270 parking spaces at Redbridge to accommodate a new waste transfer facility. It appears there is excess capacity at Redbridge P&R. The analysis of occupancy of Redbridge and Seacourt P&Rs included in the Executive Board papers, show that there is existing spare capacity at Redbridge, and but for the planned waste facility this could relieve Seacourt during the week. There is also capacity at both car parks sufficient to adsorb expected increases in weekend traffic once the Westend development completes. The Planning Statement for the Seacourt extention makes no mention of the surplus capacity available at Redbridge. The review of Redbridge in the ‘sequential test’ simple says that there is limited scope to ‘expand’ Redbridge. This is deeply misleading. There is clearly scope to redirect surplus traffic from Seacourt to Redbridge, which might be achieved at no cost simply by use of differential pricing – i.e. making Seacourt more expensive. In the Seacourt application we’re told Seacourt has to expand because there isn’t an option at Redbridge. But the Redbridge proposal is using the possible expansion of Seacourt to justify closing parts of Redbridge. So the need to expand Seacourt is at least in part being created by the Council’s wish to re-purpose part of the Redbridge site. This is clearly an unacceptable justification for the Seacourt extending into the floodplain on Green Belt land. Given the existence of sufficient capacity to deal with any increased weekend traffic related to the Westend, the arguments for the extension, contained in 3.20 of the Planning Statement, appear extremely general. Is this really the best justification the Council can offer for breaching its own core strategy, national policy on Green Belt, and guidance on development in the floodplain? The justification for this move appears to rely wholly on longer term projections about potential increases in traffic resulting from a growth in the city and county during the next 15 years. Such needs should be addressed through a strategic planning process. We understand that the Council has to increasingly rely on the revenue it earns, and perhaps the real, unstated reason why this proposal has come forward is financial. But even this doesn’t make sense. The capital cost has now doubled from the original budget to £4.1m. Extra income from the extension, assuming rates increase from £2 to £3 a day, is projected at £160,000 a year according to the Executive Board papers. Even assuming this revenue is achievable the investment would take more than 26 years to pay back, and that is without discounting for the cost of capital. If, as we believe is likely, the site floods regularly, has to be closed part of the year, and faces significant maintenance costs, the payback period will be much longer. This scheme is a nonsense and should not proceed.